A bright Autumn day bursts through the massive windows shimmering off beveled antique mirrors, reflecting the warmness of hovering lights and colorful palm leaves adorning the walls. An artistic touch filters through the space. Attention to detail, a moment experienced elsewhere inspires here. A well traveled path, culinary craft, staged, tested, blended and shared. An homage to SE Asia, time spent in France, and a NW return with an old world feel. 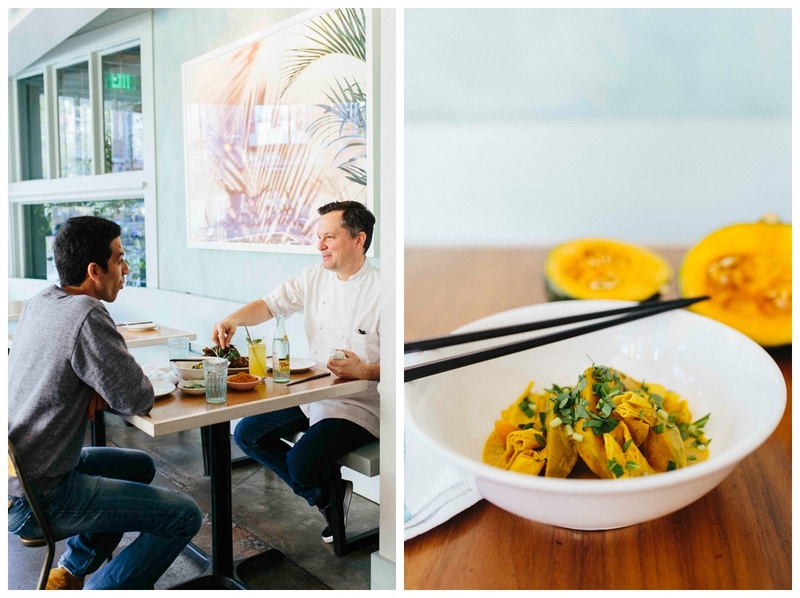 Today we find ourselves at Stateside, lunching with co-owner and Chef Eric Johnson. A day in his life before opening his restaurant would take him from working in NY establishments for 5 years, to clocking 2 years in Paris working with famous Michelin starred chefs Daniel Boulud and Jean-Georges Vongerichten, whom he followed to Shanghai as Chef for an 8 year stint, while increasing his knowledge, fascination and palette for SE Asian cuisines. Blend all to a smooth pasted in a blender or mortar and pestle. Sweat onions in oil until fully cooked with no color. Add paste and continue sweating until fragrant. Add remaining ingredients and simmer for 20 min. Cool. Eat immediately or even better the next day. Serve over steamed Pumpkin with rice. Taking it back to the city that harbored him with one of his customers favorite dishes, Hunan Chili & Cumin Pork Ribs featuring VJ spices. A sensational dish aromatic and bold from the cumin and chili, crispy on the outside, and melt in your mouth tender on the inside. Combine with ribs in a Ziploc bag and marinate at least 6 hours or even better, overnight. Deep fry the ribs, then brush with whole butter. Finally, coat with cumin mixture. Sprinkle with sliced spring onions (green parts only) and cilantro leaves. 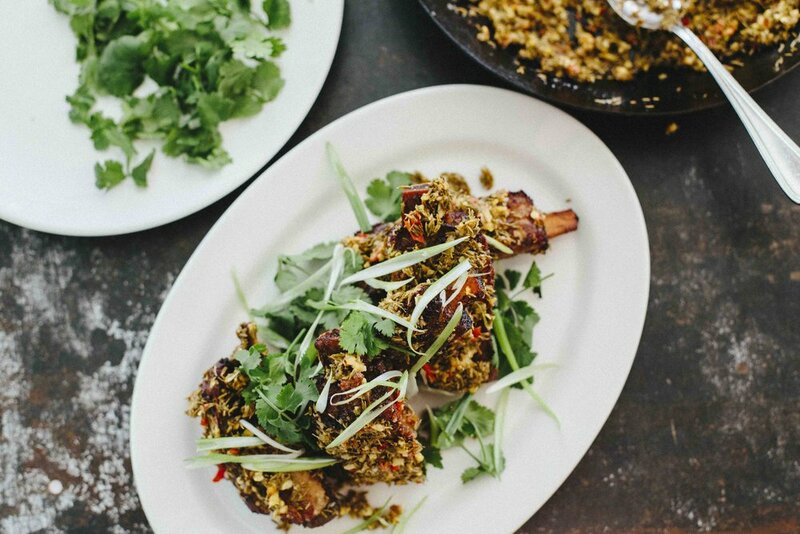 Balanced out with the freshness of spring onions and cilantro. Use plenty of quality aromatics and spices to have a recipe that will truly impress! Some businesses begin to solve a problem, fill a market void, or follow an urge to realize a passion. It’s clear that the latter precipitated the culmination of Stateside, and the natural progression of it’s success, for how could we not fall for the passionate creativity that lived experience inspires, especially when we get to benefit both in the aesthetics of the space, and the special flavor that is Stateside. Yet, what about fate and the intersecting of life’s paths? Relationships, timing and collaboration did indeed bring the idea of Stateside into fruition. Eric’s business partner Seth Hammond methodically runs the front of the house and Eric’s girlfriend Callie Meyer did the interior design and branding. Relationships old and new bring us to this instant. Mehdi Boujrada of VJ, Eric’s trusted purveyor for aromatic quality spices, and Extra Virgin Organic Moroccan Olive Oil, sits half dreaming, filled with gratitude as the time passes, both fleeting and fulfilled. A moment made memorable with good food and conversation. A love for the outdoors and a strong childhood connection from summers spent in his fathers home state of Washington brought Eric back to Seattle. His fond past now intermixed with his present as he stands hand extended with a warm welcome to us all. A parting gift shared only with good friends, VJ Ras el Hanout cocktail.